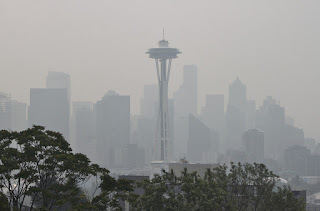 Cliff Mass Weather and Climate Blog: What kind of weather pattern produces lots of smoke in Puget Sound? What kind of weather pattern produces lots of smoke in Puget Sound? 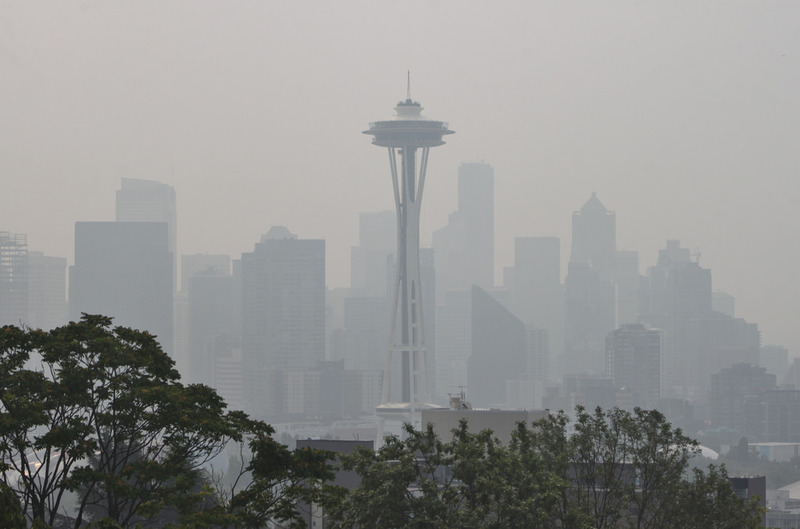 Even with all the talk about smoke here in Puget Sound, little real research has clarified the weather patterns associated with our smoky days. I will do this by using a technique called compositing--- finding a series of times of big, recent smoke events and then averaging weather maps for these times. Common features should reinforce themselves, showing us the essential circulation patterns accompanying smoke. First, let's composite a representative mid-level parameter-- 500 hPa heights (think of it like pressure around 18,000 ft)--see below. Mama mia, there is quite a signal! Big ridge of high pressure over the West Coast, with troughs (low pressure or height) over the eastern Pacific and the eastern U.S. If you really want to see the wave-like anomalous upper circulation, here is the same map with the mean values for the period taken out (these are called anomalies from climatology). Amazing. When we have smoky periods, anomalous high pressure is found over southeastern BC. Such high pressure is associated with warm, sinking air aloft. In contrast, the eastern U.S. has a cool trough when we get smoky. What about at the surface? There we tend to get lower heights (or pressure) over western Washington due to the warm air aloft (see below). We call that feature a thermal trough. In such a pattern, the normal east Pacific high pressure area is pushed offshore, other high pressure builds inland, and the onshore flow of clean ocean air is interrupted. In fact, with high pressure inland, we tend to get offshore (easterly flow), which pushes inland smoke over Puget Sound. This pattern--high pressure aloft centered over southeastern BC, thermal trough over western WA, lack of onshore flow, and modest offshore flow-- is very good for pushing smoke over western WA. And it brings warm temperatures and dry conditions across the region...good for fires. But the question you are asking is whether this pattern has become more frequent in time and whether global warming could be the cause. A very good question. 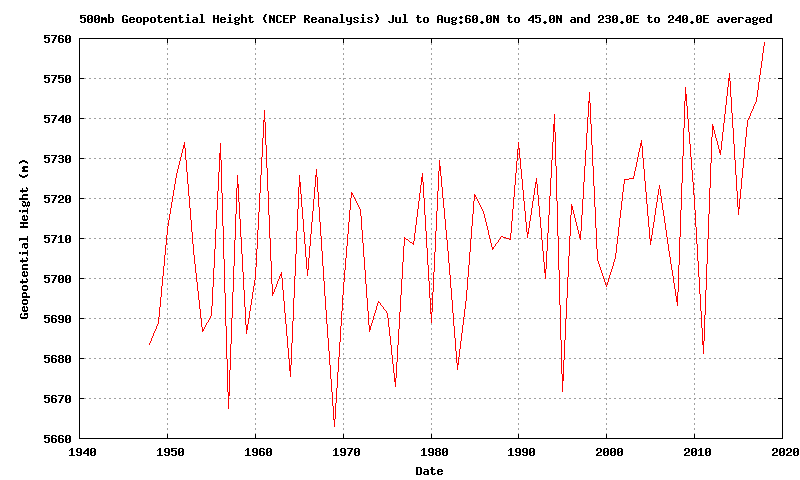 To help answer your question, I have plotted for over many years the values of the 500 hPa heights (think pressure at roughly 18,000 ft) over exactly the region associated with our heat waves-- the area centered on SE British Columbia-- for July and August (see below). Higher heights (or pressure) is associated with our smokiest periods. (see below). This figures does not provide insight into what happened during height of the smoke, but the general environment of the surrounding months. No wonder this was the big year for smoke! 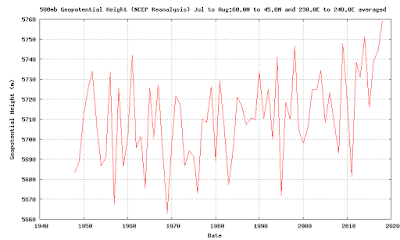 This year had the highest heights/pressures aloft since the late 1940s. Heights appear to have risen over the past decades, which is expected as the region (and the planet) have slowly warmed. Warming causes air to expand, which increases the heights aloft. This year's spike up seem anomalous and unprecedented, and this is why is would be unexpected to have a repeat next year. Why do I say that? Because I have done extensive research (with graduate Matt Brewer) on exactly this issue. Heights aloft are controlled by the mean conditions (which are slowly rising with the warming earth) and transient high pressure areas, like the one over southeast BC that was associated with the smoke. Our research (based on past trends and climate models for the next century) suggests that transient high pressure areas should be attenuated under global warming--which would work against the fires and smoke. On the other hand, global warming would warm temperatures and thus help reduce relative humidities, which thus encourage fire and smoke. So the bottom line is this. The anomalous patterns (big ridge of high pressure along our coast), which was the proximate cause of our warmth/dry conditions/fires/smoke this year, were probably not the result of global warming. Thus, they are probably due to the chaotic, random nature of the atmosphere. The small background warming we have experienced in our region (1-2F) helped the fires/smoke slightly but weren't dominant factors. 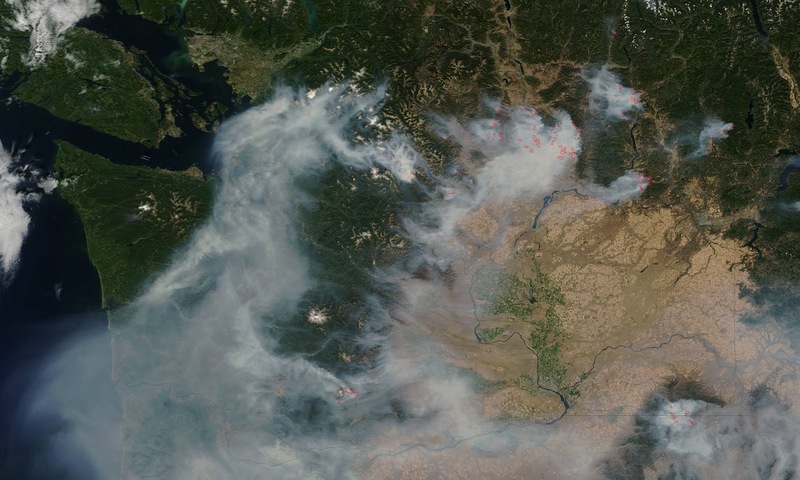 But by the end of the century, as global warming really hits, the potential for Northwest fires will substantially increase, everything else being equal. I have to disagree with this: "This year had the highest heights/pressures aloft since the late 1940s" - it looks to me from the graph you presented that this year's peak was the highest since just a few years ago, which was the highest since a few years before that, not all the way back to the 40s. Also, visually speaking (there's no regression to draw from) it appears there's a slight upward trend since the 1970s which followed a flat/slightly down trend since the beginning of the series. Would including all months of the year tell a different story? This year's may be anomalous, but then the three highest peaks have been within the past 10 years. In short, I'm getting different conclusions from the graph you presented. My 10 days of boating in the San Juans this year were all but ruined by all the smoke. Many others out there on vacation suffered the same fate. There were times when the visibility was less than 2 miles. I gather a 3-years-in-a-row repeat next year is not very likely? I see all this but my human irrational side just keeps thinking "two years of this in a row. This is just gonna keep happening, whatever purported anomalies happen to be behind it!" God I hope I'm wrong. Let us hope that with the warming of the ocean, the humidity goes up and, in turn, we also get somewhat more summer rain, and that works against fires. Any chance? I sympathize. I sail too. My only suggestion is to take your vacation in the first half of the summer- May through July, before the forests really dry out. Let us hope that these few years are an anomoly. When I moved here in the 70's, the air was ALWAYS very clear if the weather was sunny. But we are told that smoke isn't really new... that fire suppression in the last century was responsible for the former lack of fires and with the buildup of fuel on the forest floor, now we are "paying the piper". The pine beetle and climate change certainly play a role, though.